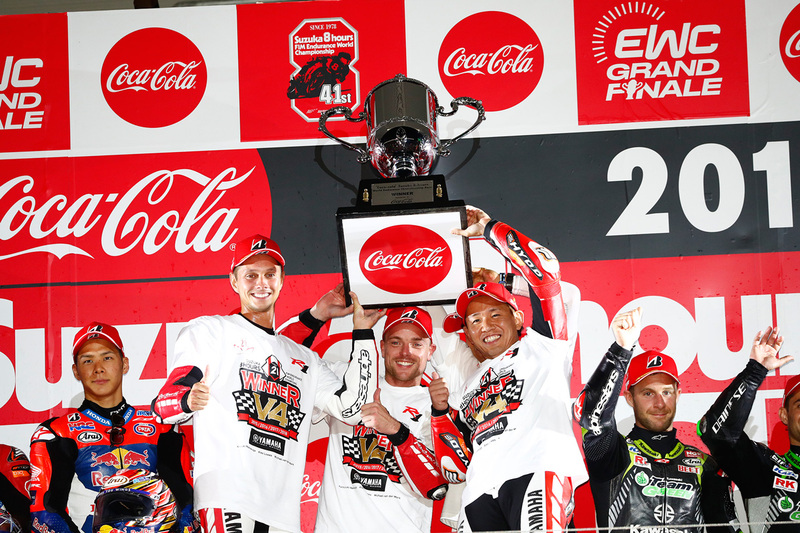 July 29, 2018 ― Rising above what has been one of the most challenging “Coca-Cola” Suzuka 8 Hours weeks of recent years, the Yamaha Factory Racing Team delivered a heroic effort today to secure an incredible fourth consecutive victory in the iconic Endurance World Championship (EWC) finale. Fellow Yamaha competitors GMT94 Yamaha Official EWC Team came tantalisingly close to securing the 2017-2018 EWC title, missing out by the narrowest of margins to take 2nd on the podium. The YART Yamaha Official EWC Team had a less fortunate Suzuka 8 Hours experience, forced to retire before the halfway point. As race day dawned this morning, Yamaha Factory Racing Team riders Alex Lowes and Michael van der Mark prepared for the 2018 Suzuka 8 Hours with a huge challenge in front of them. Following a big crash in practice, it was decided that key team member and local hero Katsuyuki Nakasuga would not ride in the race as a shoulder injury prevented him from riding at 100% fitness. Undaunted by the setback, van der Mark took control for the Le Mans start and opening stint, a major challenge itself with rapidly changing weather bringing full wet conditions just seconds before the lights went off. Remaining calm, the Dutchman didn't put a foot wrong, working his way up from 5th to take his position as a race lead contender before handing the #21 YZF-R1 over to teammate Lowes. The Brit picked up where van der Mark left off and was leading the race two hours in. The team would quickly encounter a safety car, which proved to be the first of many over the next hours, with rain, sun, crashes and spilt oil on track all causing the yellow flags to come out and a re-shuffle of the order. The time spent in between the safety cars was a pitched battle between the Yamaha Factory Racing Team and race rivals Kawasaki Team Green, the two racing less than a second apart for countless laps as they fought for the lead. A combination of race strategy, safety car interventions and pure consistent race speed ultimately gave Lowes and van der Mark the edge over their rivals in green, however the final hour of the race saw the factory Honda effort give it their best shot to close the gap. Having made it this far, the two Yamaha heroes―supported in spirit by Nakasuga-san in the pit garage―kept an unbeatable pace on their YZF-R1. Lowes eventually crossed the finish line after eight hours over 30 seconds clear at the front to record the fourth consecutive Suzuka 8 Hours victory for the team. In doing so, he and van der Mark wrote yet another page in the history books for the Yamaha Factory Racing Team and confirmed their status as racing heroes, overcoming any challenge in their path to reach the top step of the podium. The combination of the two Yamaha World Superbike riders, Nakasuga’s invaluable contribution in preparing the bike and work during the race week, and the efforts of the entire Yamaha Factory Racing Team have turned a Suzuka week of surprises, with rain, a typhoon and unforeseen challenges, into an incredible success story. The GMT94 Yamaha Official EWC Team came to Suzuka determined to give their all in the fight for the World Championship victory. Starting from 14th on the grid, they were also faced with the same series of challenges that befell the #21 factory team, with the rapidly changing weather turning the track surface from dry to wet to dry again, and numerous extended safety car interruptions disrupting their rhythm. This all made the challenge of fighting for the title more difficult. The first four hours of racing saw a lower race pace as riders David Checa, Niccolò Canepa and Mike Di Meglio worked through the weather. As the time tipped over the halfway mark, the team settled in, the pace picked up and their position climbed. As the clock ticked down, the team found themselves in a battle with their title rivals FCC TSR Honda, the two machines less than a second apart at times. Unfortunately they were unable to best them, eventually crossing the line after eight hours in sixth position to claim a worthy runner-up position in the Endurance World Championship to end their season and also, sadly, their current EWC efforts. The YART Yamaha Official EWC Team’s 2018 Suzuka 8 Hours proved a disappointing one, the promise of a strong result lost in the first half of the race. Australian Broc Parkes lost several positions from the start grid in the rain conditions, but was making up time before handing over to teammate Marvin Fritz who put the pressure on. Fritz delivered a highly competitive pace to ultimately bring the #7 YZF-R1 into seventh position. Teammate Takuya Fujita then took his turn and was eager to make an impression in front of his home crowd. A combination of fresh tyres and nervousness at his first ride unfortunately led to a highside on his first lap, causing major damage to the bike. He was able to push it back to the pits and the team worked hard to rebuild it and re-join with Parkes back onboard down in 55th place. The Australian was however unable to find a rhythm with the quickly-built machine, and missing the proper setup of their race bike, the team made the decision to withdraw for safety reasons.